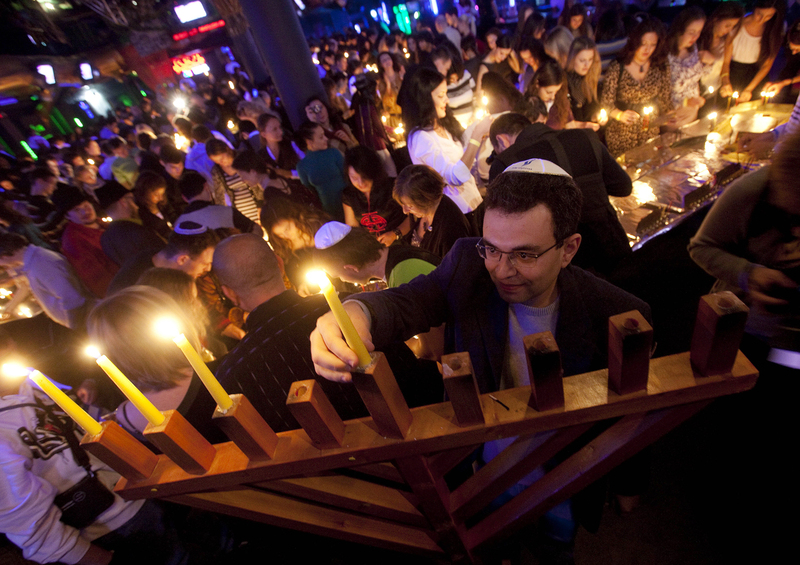 The simultaneous lighting of 1,400 candles at a Hanukkah party put Zona clubbers in the Guinness Book of Records. After decades of Jewish emigration from Russia, today a new generation of young Russians is learning about their past with the help of a number of cultural organizations. Today more than a quarter of the population of the Jewish state is Russian-speaking. Although few of these immigrants spoke Hebrew and many of them were not particularly religious, once they were on the ground in Israel, active work by Jewish organizations helped them establish a new identity. Now Jewish cultural organizations have expanded their work to Russia, helping young Russians of Jewish ancestry discover their Jewish heritage. Yulia Dobrina always knew that her grandmother was Jewish, but Dobrina herself grew up among Orthodox believers and never gave her grandmother’s background much thought. "My mother was always reluctant about admitting the fact of us being Jewish because she was still afraid of being humiliated," Dobrina said. Experts say anti-Semitism is in decline in Russia, but are they right? After attending a seminar at the Jewish Youth Center, however, she registered to become a member of the organization. Six months later, she received an invitation to travel to Israel for 10 days for free as part of the Birthright program. "Obviously I took advantage of the opportunity," Dobrina said. After the trip, she began participating in the Eurostars educational project for Jewish youth and is now more willing to identify herself as a Jewish person. Thousands of Russians with Jewish ancestry have similar experiences every year. Birthright, also known as Taglit or Birthright Israel, is one of the most popular points of entry into the Jewish world for those looking to explore their Jewish ancestry. The trips have become especially popular in Russia today, as the country’s economic problems limit the ability of many to travel abroad. Anna Birinberg, director of the Gillel Jewish Center, which offers the program to Russian youth, says that anyone between the ages of 18 and 26 who is at least a quarter Jewish can participate. A person’s ancestry must be documented through such items as family passports. The main purpose of the program is to acquaint people with Jewish ancestry with the culture, history and religion of the Jewish people. During a Birthright trip, groups of up to 40 young people visit museums and historically important places all around Israel. The program is financed by philanthropists, the state of Israel and relevant foundations. According to Birinberg, after the Birthright trip, most of the participants continue to explore Jewish culture in Russia. One or two people move to Israel and four to five participants go to Israel to study for a period of five to 10 months through a more serious program called Masa. The options for study are vast, ranging from the intensive study of Hebrew to courses required to qualify as a diving instructor. The Israeli government offers the participants grants that fully or partially cover their living expenses during their studies. Daniil Mashtakov participated in a Masa program and has now been living in Israel for more than a year. "Masa helps one get to know the country very calmly, study the language without being distracted by millions of practical problems. Perhaps today it is the easiest way to familiarize oneself with Israel in order to decide whether or not to move here," Mashtakov said. The Taglit and Masa programs are offered throughout the world, but there are also initiatives that are unique to Russia. One of the most successful is the Eurostars educational project. Mikhoel Stavropolsky, the project's Moscow director and head of the JEWELL youth club, said that he benefited from his participation in the Stars project, which offered Jewish youth a scholarship to attend Torah courses. This program was criticized for paying students to attend religious classes, and in 2013 the scholarship was replaced with a trip to Europe at the end of the school year. The trip proved to be both a popular incentive and a good way to unite the participants. The program today has expanded and has branches in nearly all of Moscow’s neighborhoods. In 2013, 100 students from four cities participated in the program. This year’s class has 1,200 students from more than 40 cities. At the end of their coursework, they will take a cruise on the Baltic Sea. In the 2010 census, 157,800 people in Russia identified themselves as Jewish. The number of people in Russia with Jewish roots is as much as 10 times higher, but many of them either do not know about their ancestry or do not want to admit it openly. These people are the main targets for Jewish heritage organizations. Lyudmila Zhukova, a docent at the Russian State University for the Humanities, says that while the activities of some Jewish cultural organizations can be described as missionary, they aren’t looking to convert Orthodox Russians — they are just reaching out to non-practicing Jews. "That is why for those young people who turn to Judaism it is first and foremost a way to obtain an identity," Zhukova said.